My final experience with a fifth birthday party actually occurred a couple of months ago. I have to say this party was very unconventional for me. I didn't stick too closely to my guidelines. Our youngest son turns five in late August. 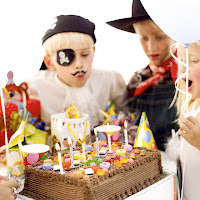 I have learned from experience it is hard to have a summer birthday party as many people are away, or your not sure how to get ahold of his school friends. So, we actually had an unbirthday celebration for him in May--near the end of the school year. My first and foremost guideline that I did not follow was the number of children at this party. I asked my son who he wanted to come, well he said all the kids in his class were his friends and he wanted them all to come. Great--so that's 12 children right there. Then, I ,of course, invited parents and siblings to stay so no one would have to do a lot of driving. It was a bigger birthday party then usual. We decided on a pirate theme for the party. I purchased some pirate plates and napkins. I had a cake made with a pirate scene decorated on it, but I placed little pirates, a treasure box, and a small ship on it, it was pretty cute. Also, since there were so many children, I knew a craft was probably out of the question. I purchased some treasure boxes(from Oriental Trading) that my husband and I put together and we used for a later activity. So here is how our party went: For invitations I went to the store and got a ream of paper that looked like parchment paper. I typed the invitation, printed them out on the paper, and handed them out to parents at school. 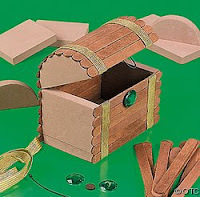 The parchment paper was also used for thank you notes and a treasure map. The party was a picnic to be held at the house after school. That way everyone could follow me to my house. I had a small moon bounce, the sand box, swing set, a well supervised trampoline, and I was going to have water play. Unfortunately, Mother Nature wasn't up to cooperating with an outside party. She kept sending rain off and on. It didn't bother the kids, and thank the Lord we have a big basement full of toys. Everyone arrived at the house and I set up for lunch. We had purchased pizza which my husband picked up on his way home from work. I also had hot dogs in the crock pot ready to go. Along with these I had watermelon, drink boxes, and chips. The kids played while I and some of the other parents got lunch ready. It was actually a blessing that all the parents came--there were eyes everywhere to watch the kids, and plenty of helpful hands. After everyone ate, a pirate showed up with a treasure map. Yes, he was the same pirate from the Pretty Princess Party--he comes in handy. My son has a big treasure box in his room and my husband and I had put the smaller treasure boxes we made filled with "gold coins" in the bigger box. He then had dug a hole the day before and we "buried" the treasure. The treasure map ha d the children looking for different things. They first had to look for the number 4 which was on the mailbox. Then they had to take 10 steps and look for another number which was posted on the telelphone pole. Then there was a shovel hanging in the tree and the map said to go somewhere to dig with the shovel--(the sandbox). In the sandbox there was an egg and the map said to go somewhere that animals have shells. (We have a turtle habitat in the yard: http://www.tallysturtles.com/). Then they had to cross the bridge and look for the X. We had placed a board in the yard for the bridge and had put an X on the wood covering the hole. Then the pirate helped them pull out the treasure box and they all got their own treasure. Then they ran off to play. While they played we got the cake ready. We sang Happy Birthday, had ice cream cups, opened presents, then traveled home. It was a hectic party: A: because of the rain, and B: because of the number of children. I normally would not have had that many children, but my son had a great time. We got some good pictures, but they all had the children in them and I did not get an okay from parents to share them with the world. So, there you have it. My ideas for some birthday parties. I hope they may have helped someone planning a party. What a fun birthday! Now that my kids are all in their teens, we haven't done a theme party in years. Takes me back, that's for sure!